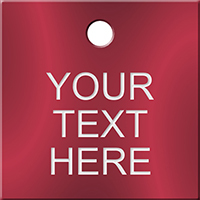 Our Slit Tags are ideal for apparel and all types merchandise. 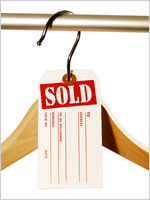 Tags easily slip over a hanger through the slit. 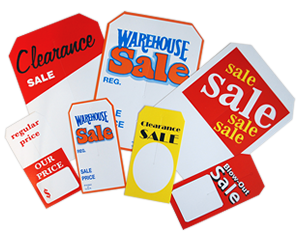 These tags are great to display your SALE, reduced prices, or a comparison of old and new prices. Proven to boost sales, “SALE PRICE” slit tags slide right over the existing price tag to show that the product is now offered at a cheaper price. • Slit Tags may also be utilized as drop tags, as they fit over most swivel style hangers. 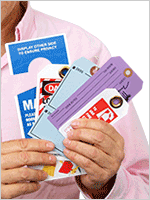 • 12 point cardstock is ideal for normal indoor use. • Attractive prints grab shoppers’ attention. Strung and un-strung writeable tags you can hang, staple, or pin. Get plain Manila or bright colors. As low as 3¢ a tag! As low as 4¢ a tag! As low as 6¢ a tag!